Fritz, Tom, Frank, and their friends, Rocko and Courtney (Rocko's fiance) attended the 2011 Jagermeister Country Music Tour! Fritz's Polka Band is truly proud to be a member of the Jagermeister Family. Just one of the many perks that Jager provides bands is the opportunity to check out the Jagermeister Music Tour (in a VIP way!) when it's in-action. On Friday, March 25, 2011, Fritz and his bandmates in Fritz's Polka Band, Tom Campbell and Frank Nelson, along with their friends, Rocko Dorsey and his fiance, Courtney made the trip to Poughkeepsie, NY to check out the Jagermeister Country Music Tour, which featured Dierks Bentley as the headliner. Fritz, Tom, Frank, Rocko and Courtney had a blast meeting old friends from the "Jager Family" that evening, as well as making new friends. Below are some pictures taken that festive night. Frank looks on as Tom and Courtney tear up the dance floor while Dierks Bentley tears up the stage during the Jagermeister Country Tour in Poughkeepsie, NY on March 25, 2011. Franks looks on as Sarah Whittle sashays to the beat during the Jager VIP Party on March 25th in Poughkeepsie, NY. Frank, Tom, Fritz, and Rocko are shown here with Lee Einsidler (CEO of Sidney Frank Importing Company, Inc., the importers of world-famous J�germeister) and some Jagerettes during the VIP Party in Poughkeepsie, NY during the Jagermeister Country Tour on March 25th. Frank, Tom, and Fritz are shown here with Jack Carson (Jager Tour Manager) during the VIP Party on March 25, 2011 in Poughkeepsie, NY. Rocko and Frank are shown here with some Jagerettes during the Jager VIP Party on March 25th in Poughkeepsie, NY. Tom and Fritz are shown here with Sean Patrick McGraw during the Jager VIP Party on March 25th in Poughkeepsie, NY during the Jagermeister Country Tour. 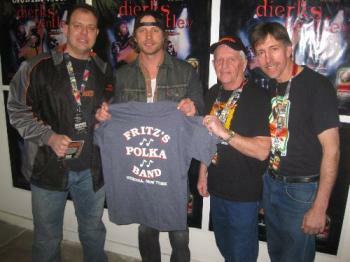 Fritz, Tom, and Frank present Dierks Bentley with an FPB shirt backstage on March 25th during the Jagermeister Country Tour. How's the saying go....Three navels are better than one? Maybe...maybe not. Here, Tom gladly poses with his Jagerette friends backstage at the Jagermeister Country Tour in Poughkeepsie, NY on March 25, 20111. Tom, Fritz, and Frank of FPB with their buddy Rocko pose here during the VIP party on March 25th during the Jagermeister Country Tour. Tom and Frank pose here with some Jagerettes during the VIP Party on March 25th in Poughkeepsie, NY. Can you tell Tom, Fritz, and Frank love being in a Jager band? Here, they pose with some Jagerettes during the VIP Party on March 25th at the Jagermeister Country Tour. Rocko, Frank, Fritz, Courtney, and Tom have a Jager toast during the VIP Party at the Jagermeister Country Tour in Poughkeepsie, NY on March 25th.